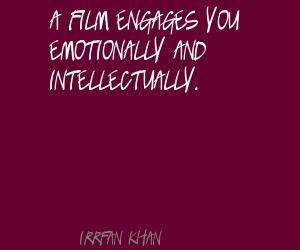 See the gallery for quotes by Irrfan Khan. You can to use those 6 images of quotes as a desktop wallpapers. When you come out of the theatre and you don't even talk about that film or remember it, then it disappoints me. You cannot reduce the power of story with the tag of money because it's not a share market. So you must know the seriousness of the power of storytelling. A film engages you emotionally and intellectually. A nation needs to know how to utilise talent. Hollywood isn't ready for an Indian leading man. I am lucky that the Western world chooses me to play roles in their movies an television, whatever language it may be. I can't think of a more pathetic situation for an actor than to do a film and not connect to it. And I pray to God that I never face that situation. I don't want to do romantic roles where I have to lip sync to a song. A role that explores romance on a new level would suit me. I will only do a Hollywood film when there is something special offered to me. I'm trying to strike a balance between Bollywood and Hollywood. 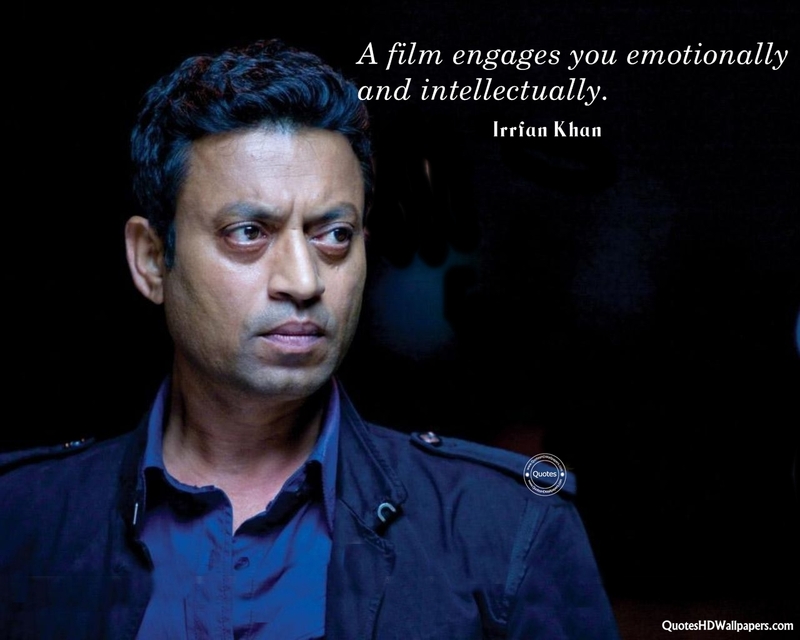 Much more quotes by Irrfan Khan below the page. In India, therapy is not part of the culture; it has not become such a big need. It surely gives you a high to be an international actor with quality work. Our Bollywood stars who talk of being part of 100 crore films, I think I belong to the 1,000 crore club. Parsi theater was known for melodrama. We don't have a culture of realistic acting in India. What happens with every role, you have to trick yourself, you have to creatively find ways to explore the mental state of your character.